Hello friends! It’s been awhile since I made any Birthday Cards just for fun (and my Birthday Cards pile seems to be getting smaller and smaller) so the timing is perfect to one one just in case. Today I’m playing with Hero Arts Cake Layering stamp set and “cooking” a watercolor cake. The yellow and pink color combo continues to fascinate me so these are the primary colors on my project here. I’ve had this set for a few month now and to tell the truth I couldn’t find the perfect way to use it (to color the cake layers), but since I am really into watercolor these days I decided to just watercolor it; love the way it turned out! I am actually inspired to make a set of birthday cards using these stamps. 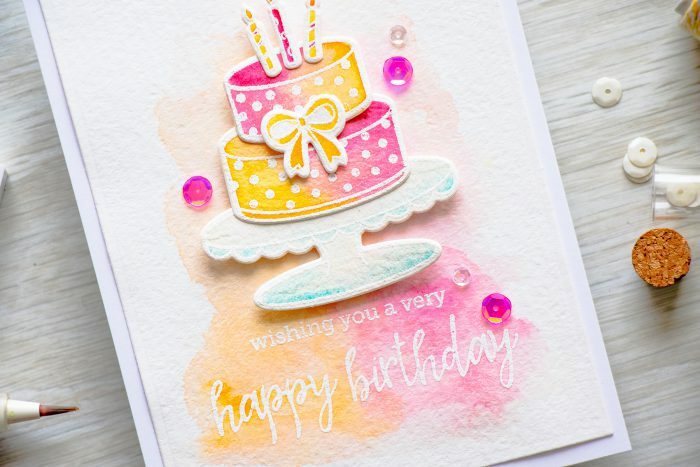 To create the card I started by heat embossing cake layers, stand, candles and bow in white embossing powder onto Arches Cold Press Watercolor paper (I plan order Arches Hot Press paper for projects like these where stamping is done as it has less texture). I die cut the layers out and colored them using Daniel Smith Watercolors from the watercolor sampler sheet. 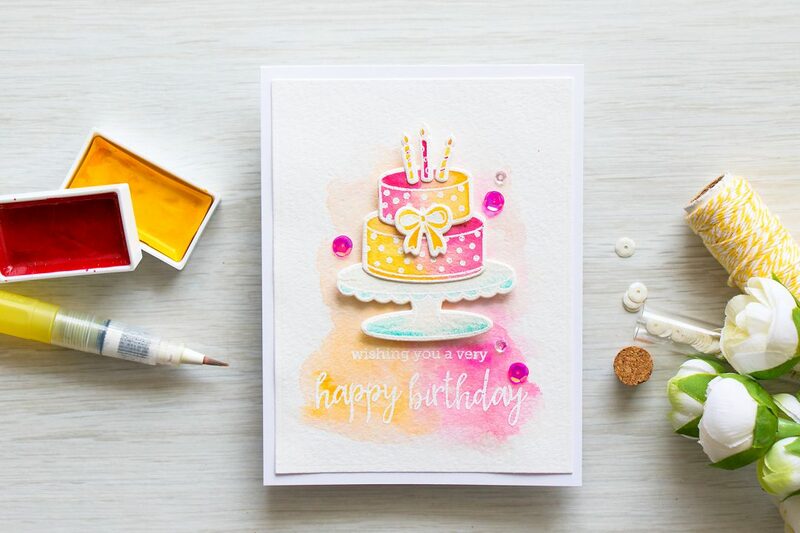 For the background I first heat embossed a Happy Birthday sentiment and then added a soft wash of yellow and pink. My cake was foam mounted onto the background (the layers were adhered using Multi Medium adhesive in matte) and the card was embellished using a few Strawberry Sequins and Clear Droplets from Pretty Pink Posh. Oh so beautiful Yana. A wonderful card! 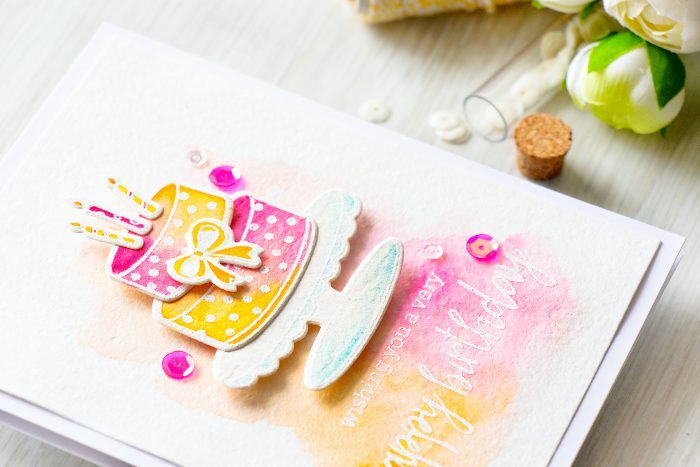 Hi Yana ~ This is such a fun and happy card! You’re right about the color combination; it’s lovely. Thanks for sharing! 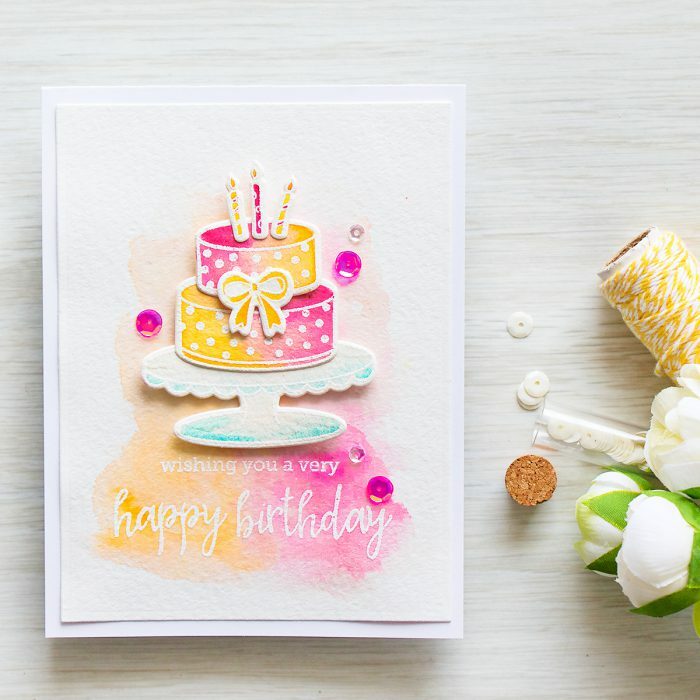 Beautiful birthday card, love all the dimension and soft colors! Stunning card!! Those colors…(miss here emoji with heart eyes). So yummy!